Ford has brought back the Mustang California Special after taking a year off, adding a string of new features. This special edition has been part of Mustang’s family since 1968. For the California Special, Ford has retained the original trademark look and feel of the Mustang such as fading stripes and a classic badge on the lid of the trunk. Seats have been trimmed with red accent stitching, while floor mats are custom embroidered. For most of the 2019 versions such as the Mustang Bullitt, only manual transmission is available. However, the limited-edition Mustang GT California Special would come with a 10-speed automatic. “Few things are more satisfying than dropping the top on a California Special and taking a drive down the majestic Pacific Coast Highway,” said Ford designer, Mark Conforzi, in a press release. “This signature design takes its cues from the original California Special, while enhancing the personality of today’s Mustang. The Ford Mustang California Special limited-edition introduces vintage colors, 12-speaker B&O Play audio technology, and rev-matching technology that allows for a smoother transition of the 6-speed manual transmission. “This makes you feel like a racing driver,” said Jean Jennings, editor-in-chief of Automobile Magazine, who praised the latest “rev-matching” technology, according to Freep. Further, rev-matching technology enables gears to spin at different speeds once the engine transmission shifts. The technology matches the revolution of the engine with that of the gear so that the driver does not experience rough shifting. During downshifts, the rpm of the engine bumps up, to allow smooth transition between the gears. The new Mustang GT comes loaded with the 5.0-liter V8 engine, 460-horsepower and 420 pound-feet of torque and clocks 155 miles per hour. 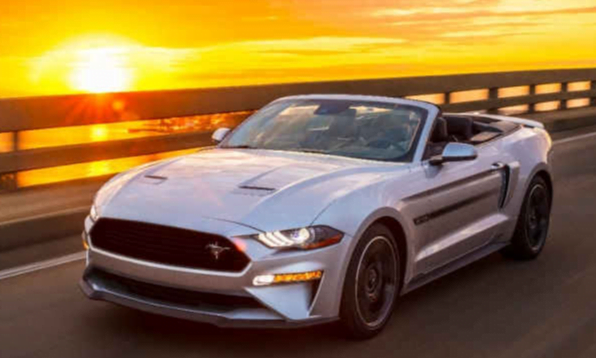 Jessica Caldwell, a senior analyst at Edmunds, believes that the sports car segment draws passionate buyers, and Mustang comes with special packages that stir up the emotions. The Ford Mustang California might not bring in the volume of a Ford F-150 pickup, but would be a delight for Mustang fans, Caldwell said. Besides the Mustang California Special, the Ford Bullitt has also been the talk of the town. The car was first shown at the Detroit Show in January, and will go into production in June. The model is a tribute to the iconic movie starring Steve McQueen. The Ford Bullitt is the third such model with the first one launched in 2001 and the second one in 2008. The latest model celebrates the 50th anniversary of the car’s starring role in the film, notes The Car Expert. The Ford Bullitt comes with the 5.0-litre V8 engine giving 464hp, 14 horses more than the most powerful model currently – the GT. The car also comes with the rev-matching technology to smooth the transition. Further, buyers will have the option to select from different shades – such as Shadow Black or Dark Highland Green exterior colors. Apart from the Mustang California Special, Ford also announced changes to the rest of the Mustang lineup. Now, there will be turbocharged, four-cylinder EcoBoost Mustangs with the dual-mode exhaust, which was introduced on the 2018 GT. Also, every stick-shift GT has now been integrated with the rev-matching functionality for downshifts. New shades available are Velocity Blue and Need for Green. Last month, Ford also revealed the details of the revamped Edge, touted as the most technically advanced SUV yet. The automaker has ramped up the driver assistance technologies to optimize the current camera and sensor advances. Further, the adaptive cruise control comes with a system to keep the car centered in the lane along with features like post-collision braking and evasive steering aid. The new Edge would be available with the 238hp bi-turbo diesel engine and new eight-speed transmission. Ford will start delivering the 2019 Mustang this summer. The pricing details for the California Special or any other in the lineup have not been revealed yet.